1. Place a large stockpot on the stovetop and add 2 oz. of raw seaweed to the bottom of the pot. 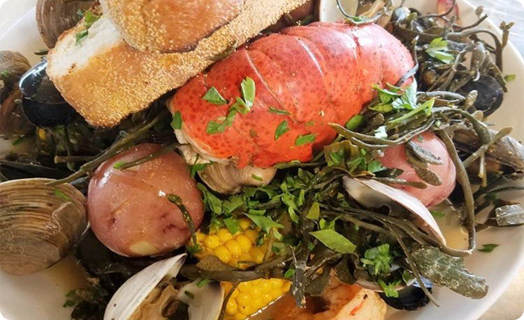 Place the potatoes, clams, corn, lobster tails, shrimp, and mussels (in this order) on top of the seaweed. Next, add white wine, water, salt, pepper and Old Bay seasoning on top of the seafood ingredients. Lastly, add the remaining 2 oz. raw seaweed on top. 2. Turn the stove on high and cover for 8 minutes or until water is boiling. Once the water starts to boil, turn to the heat down to medium and continue to cook for another 7-9 minutes. Check to make sure the clams and mussels are starting to open. 3. Transfer the entre contents to a large serving bowl. 4. Finish with a warm slice of Ciabatta, and a pinch of parsley for garnish, and ENJOY!